Toccata Townhomes is a limited collection of pre-sales South Surrey townhouses in Morgan Heights community that stand apart from all the others and is perfectly situated just south of the morgan creek golf course in morgan heights, a much-coveted new community in south surrey real estate. At this moment, we are currently constructing the presale Toccata Townhomes presentation centre and preparing for our grand opening expected later this fall. As a priority registrant, you will receive new information about the South Surrey Toccata Townhomes as it becomes available and be invited to be one of the first to own at toccata. Stay tuned for more information. A high level of luxury living at these South Surrey townhomes at Toccatta are coming soon! With various floor plans to choose from (initial estimate are two and three bedroom layouts), the pre-construction South Surrey houses for sale at the Toccatta townhomes are going to please every type of homebuyer, whether you are first timer, retiree or someone looking for a great investment long-term. The finest finishes, gourmet kitchens, sumptuous bathrooms and large spacious open living spaces will be great features at the pre-sale South Surrey townhouses for sale at the Toccata townhomes. Many of the floor plans will also afford large outdoor living spaces in the form of patios and balconies which will have amazing views of the water, mountains and city. The Toccata townhomes in the South Surrey real estate market are going to be well sought after as they are luxury townhouses for sale close to the White Rock border. Great exterior architecture, landscaping, green spaces and an interior courtyard will cap it all off as this master planned South Surrey Toccata townhomes gears for its marketing release of pre-sale units. Now accepting priority registrations from potential and interested homebuyers, Toccata South Surrey townhouses for sale is a limited collection of only 62 thoughfully designed and finished townhomes for sale that offer two bedroom, two bed plus den or three bedroom floorplans. Located just south of Morgan Creek Golf Course at 2929 – 156th Street, South Surrey real estate, here you’re very close to shopping, restaurants and recreational options. In addition, your new Morgan Creek South Surrey neighbourhood at Toccata Townhomes will be close to schools, parks and a broad range of schools for your children. Stylish urban living meets active outdoor lifestyle here at the pre-construction Surrey Toccata Townhomes for sale. For more information about this new Morgan Creek South Surrey real estate development at Toccata Homes and to ensure that you’re at the top of the priority list for sales launch details, incentives and updated information including floor plans, please visit www.toccatacollection.com or cal Nav at 604.583.2212 today. Executive townhouse living is finally here at the affordable Surrey Nature’s Corner townhome development. A true family and pedestrian friendly neighbourhood, this master planned Nature’s Corner Surrey townhome community features three bedroom homes for sale that are both spacious as well as functional. In terms of the community itself, this masterplanned Surrey townhouse neighbourhood features beautiful green spaces, exterior walkways, professional landscaping and lots of trees. A real family neighbourhood where you can meet new people and create new friendships and memories, these new Surrey homes for sale are now close to being complete. Found at the corner of 150th Street and 60th Avenue, the Surrey Nature’s Corner townhomes offers spacious executive townhouses designed with sunny, open concept floor plans and meticulous attention to detail. Located in an established neighbourhood setting that is close to nature and outdoor recreational activities and pursuits, these new Surrey townhomes present the best of both worlds: executive urban living with the best that nature can provide. The pre-construction Surrey townhomes at Nature’s Corner development is close to schools, parks, shopping and many other city amenities/services. The Surrey home floor plans here are open and functional and are certainly designed with the homebuyer and family in mind. All of the new Surrey Nature’s Corner homes for sale are multi-level residences complete with large bedrooms, dens/office space, extra storage, large windows for natural light and the best features available as well. The exterior design of these impressive Surrey townhouses for sale are both traditional, Craftsman-like and appealing with lots of great curb appeal. On the inside of the new Nature’s Corner Surrey townhomes for sale, you will find spacious layouts and bright rooms, no matter which home you choose as your own. More information about the presale Nature’s Corner Surrey townhomes can be found online at www.liveatnaturescorner.com or you can call either 604.306.3500 or 604.834.6262 today. The new Surrey homes for sale are located at the corner of 150th and 60th. From schools to parks and from shopping to dining, the centrally situated presales Surrey townhouses at Nature’s Corner are certainly close to work and play. If you are coming from the City of Vancouver, Nature’s Corner townhomes are very close as you can easily take Highway #1 east to the 152nd Street exit going South. Now heading the same direction on 152nd Street, you can turn right at 60th Ave and you will find the presales Surrey Natures’ Corner homes for sale right there. This is a very quick trip. The townhome community features pedestrian walkways, green spaces and plenty of room for you to enjoy the outdoors and take an evening stroll within the neighbourhood. Quiet and safe, the new Nature’s Corner Surrey homes for sale are located within an established city neighbourhood. The entire development consists of 18 affordable residences, of which there are 6 duplexes and 4 fourplexes (containing four townhomes). There is an outdoor amenity space, a pedestrian only walkway in the centre of the community and tonnes of large trees too. The A floor plan at this new Surrey townhome community features three level living features fourteen hundred and three square feet excluding the single attached garage and carport. The main level area will consist of a deck, living, dining room, open kitchen with island and a breakfast nook as well. There is a powder room on this level. In addition, the upper floor of this new Surrey Nature’s Corner townhouse features three bedrooms and two bathrooms in addition to a washer and dryer. Plan A1 is essentially identical with the same square footage but features a tandem 2 car attached garage (rather than the carport). Floorplan B at Nature’s Corner Surrey homes for sale features thirteen hundred and ninety nine square footage and a tandem garage while Unit D layout is one of the larger Surrey homes for sale and features 1426 sq ft in size over three levels and excluding the tandem parking. There are multiple decks and patios in this floor plan that features a unique country style kitchen nad separate dining/living space on the main level. The Nature’s Corner presale Surrey townhome plan unit E is 1528 square feet in size and features a configuration of E1 at 1431 sq ft with a single garage plus carport and also E2 at the same square footage with a kitchen nook. The interiors and exterior features list for the new Surrey real estate development at the executive Nature’s Corner townhomes is coming soon online. Alternatively, you can ask a sales staff for those details at the display home. The presales is being handled by a company called Prudential Power Play Realty and you can contact them at sales@liveatnaturescorner.com by filling out their online form. The official sales and marketing website for the presale Surrey Nature’s Corner townhome development is located at www.liveatnaturescorner.com. You can phone (604)834-6262 or (604)306-3500 today. Here is the latest availability of townhomes available at the new Surrey Nature’s Corner townhouse development in no particular order. The first Nature’s Corner Surrey townhouse for sale is Unit #17 6022 150th Street Surrey, BC that is listed at $364,900 and features three bedrooms and 2.5 bathrooms with maintenance fees of only $130/month. The next town home available for homebuyers is #2 6022 150th Street Surrey where you will find a three storey end unit that also features 3/2.5 configuration with 1392 square feet of inside living space. The third presale Surrey Nature’s Corner townhome for sale is Unit #11 which is listed at $372,500 and accepting offers and has a fully finished basement area with 1403 sqft of space. Last but not least is the presales Surrey townhouse unit #4 at Nature’s Corner development that is listed at $379,900 and is also an end unit with 1528 square feet (the largest available floor plan). The new Surrey townhouses are part of a strata community that allows for low maintenance living and stress free lifestyles. The strata management company is designated to Baywest Property Management. The community is pet friendly and are within walking distance to Cambridge Elementary School. In addition, the presales Surrey Nature’s Corner townhomes community features lots of parking on site, hardwood flooring, stainless steel appliances, crown mouldings, granite counters and a gated neighbourhood, making it very safe and secure for families. We’re pleased to announce that our BOSA Silver Lining Sale at the White Rock Miramar Village condos and Burnaby Esprit HighGate condominiums will be held-over until Labour Day – this is your final opportunity to secure a brand new Bosa Properties home at unprecedented Greater Vancouver real estate values. Since our launch of the BOSA Silver Lining Sale for luxury condos earlier this summer, 88 presales homes have been sold, to first-time buyers, empty-nesters and investors alike; and there are just 28 pre-sales homes that remain available for sale between the Miramar Village White Rock real estate development and the spectacular new HighGate Esprit condo tower residences. Why has this BOSA Silver Lining Sale been so successful? Because the Silver Lining Sale at BOSA Properties represents true and tangible real estate value. And it represents an opportunity to own a great White Rock or Burnaby HighGate condo home or townhouse built by a respected builder, at a great price. Interest rates are on the rise, new home inventories are shrinking, and MLS sales activity has been at a record-setting pace in recent months. 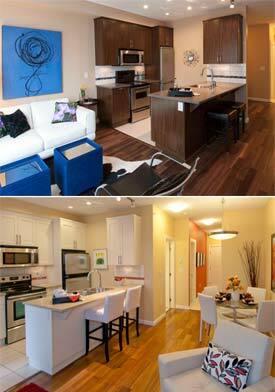 Here’s a sampling of the presales White Rock and Burnaby homes available until Labour Day, September 7th, 2009. Located in the heart of White Rock real estate market, Miramar Village condominiums represents the finest condo high-rise quality you’ll find outside of downtown Vancouver. Here are a couple o sample BOSA Miramar Village luxury condo opportunities for first time home buyers to empty nesters and for condo purchasers in between looking for the best property available: Suite 201 B is 1274 sf with a 1112 sf patio and was originally priced at $829,900 and now reduced to an outstanding $655,900 so that you can own for only $1458/mo. Also available at the presales White Rock Miramar Village BOSA Silver Lining Sale is Suite 501 B at 1274 sf with amazing ocean views and priced from $835,900 down to $660,900 so that you can own this magnificent White Rock home for only $1469/mo. Located steps from our award-winning HighGate Village in South Burnaby real estate market, Esprit condo tower residences offers spacious and unique home designs and unbeatable value. Here are a few BOSA Esprit condos and villa homes for sale thorugh the Silver Lining Sales that has been extended. Suite 1507 is 1111 sf and has northwest exposure and was originally priced at $537,900 and has been reduced to only $482,900 for only $1073/mo. Suite 2307 at the BOSA Silver Lining Sale at Highgate Burnaby Esprit condos for sale features 1111 sf and is N/W views priced from $578,900 to $514,900 and own from just $1144/mo today. Lastly, this magnificent BOSA Silver Lining Sale opportunity presents a presales HighGate Burnaby Esprit Villa 1 floor plan of 1933 sf with west exposure and was originally priced at $719,900 and has been reduced significantly to only $618,900. Own from just $1375/month. In addition to the significant price savings available to you at the BOSA Silver Lining Sale at Miramar Village White Rock and HighGate Burnaby Esprit Condos, we’ve negotiated a powerful mortgage savings program that provides you with the equivalent of 1% mortgage payments on each and every presales home purchased. With this Silver Lining BOSA condo sales program, you’ll save thousands each year with our drastically reduced 1% mortgage payments. If you’re a member of the Bosa Properties family of owners, we hope you’ll take a moment to consider ownership of another stunning Bosa Properties home either at the Esprit Burnaby HighGate condos or Miramar Village White Rock real estate development. If you’ve not yet owned a Bosa Properties home, we hope you’ll consider doing so – we look forward to adding your name to the list of literally thousands of British Columbians who are proud owners! For more information about the extended BOSA Silver Lining Sale at Espirt Burnaby and White Rock Miramar Village real estate developments, please visit www.bosaproperties.com/silverlining. If you’re in the Greater Vancouver real estate market for a great new home at a great price, we hope you’ll come and visit with us. Our BOSA Condo Sales Centres are open daily from 12-5pm. We look forward to seeing you soon! Sincerely, Shannon and Christine, Miramar Village Sales Mgr and Esprit Sales Mgr at 604 542 8700 or 604 540 2672. Located on Georgia Street, the major thoroughfare in downtown Vancouver’s Coal Harbour real estate district, the new pre-construction Vancouver COSMO condominium high-rise tower will soar twenty three stories into the city skyline and be fronted by some of the most prestigious and well known landmark addresses in the city. From Beatty Street to Georgia Street and from Citadel Parade to Coal Harbour, the downtown Vancouver COSMO pre-sale condos is a prominent new condominium high-rise development by Concord Pacific developers. The first high-rise tower to launch sales and marketing post global economic crisis, the Concord COSMO Vancouver condos for sale will be affordable yet luxurious, providing both comfort and affordability to home buyers seeking the best of both worlds. The pre-sell at Georgia and Beatty street is without it’s opponents, but here are certainly hundreds of homebuyers seeking luxury at such affordable Vancouver downtown condo pricing. Featuring two hundred and fifty three apartments for sale over 23 stories, in addition to luxury Vancouver COSMO townhomes, the development is designed by James KM Cheng Architects and the interior designer is Portico Design Group, a team collaboration like no other. The tentative completion date for the downtown Vancouver high-rise tower residences at COSMO living is slated for the summer of 2012, so you will essentially be purchasing these pre-sell condos at bargain basement pricing with the ability to lock in your interest rates too. 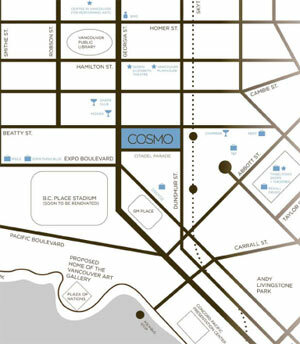 The sales centre for COSMO Vancouver condos is located at 88 Pacific Boulevard at Carrall and is open 10am to 5pm every day right now. The pre-sell Vancouver COSMO condo floor plans will range from studio stuies at around 455 square feet to one bedroom between 531 and 601 sq ft and one bed plus den units at 607 to 796 square feet. The larger residences at COSMO Downtown will include the two bedroom plus den floor plans that range from seven hundred and ninety square feet all the way to nine hundred and thirty nine sq ft in size. The pricing is also very affordable for downtown Vancouver condos for sale and range from $218,800 to $258,900 for studio plans, $259,900 to $316,900 for one bedroom floor plans and $289,900 to $374,400 for floorplans with dens. 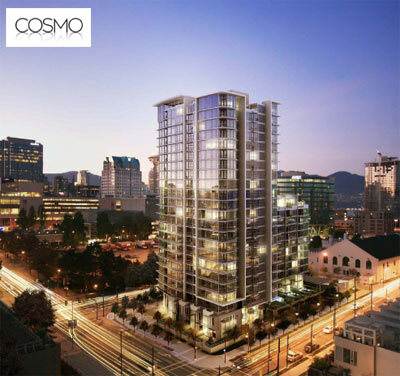 The pre-sell COSMO Vancouver two bedroom floor plans will range from $369,800 to $513,800, which represents the best value for new downtown Vancouver real estate condominiums. Do you know what the HST price difference on a new home is after July 1st, 2010? Check out this online chart that outlines the 12% BC HST tax increase on new property next year. Long marketed, the Concord Pacific COSMO condo high-rise tower pre-sell events are now happening. Following in the footsteps of Aquilini Developments’ Richards Condo Living in downtown Vancouver, the next high-rise tower residence to be resurrected after the global economic crisis is now Concord Pacific’s COSMO Vancouver Downtown residences. With new price points, these pre-sell Vancouver condos are now much more affordable and attuned with the local market, which now seems to be in the $600 per square foot range. Before the economic crisis began, downtown Vancouver pre-sell condos were selling off the shelves at more than $825 per square feet. With an unsurpassable location that is close to the business district, entertainment, shopping, dining, Coal Harbour, Stanley Park and the waterfront areas, the downtown Vancouver COSMO condos for sale are simply too good to pass up. The actual residential building will rise a staggering 23 stories above Georgia Street at Beatty and with close proximity to all the sporting venues such as GM Place and BC Place, the condo tower residences will be a focal point for many sports fans as well. The lobby design is truly urban and modern, but very luxurious and unpretentious while the furniture and furnishings for the COSMO Condo building will be presented by Armani Casa. Walls will be lacquered, and a fireplace with full height surround of marble and metal will be constructed. 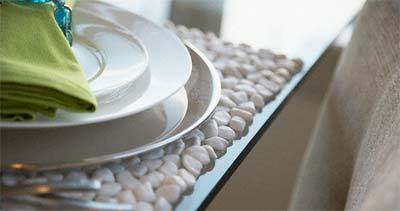 There will also be a twelve hour per day concierge service here at COSMO Concord Pacific condos. Some of the common areas will present unique features for residents at COSMO living that includes a bowling alley, large screen television media room, bar, lounge seating as well as an outdoor terrace on the eleventh floor of the high-rise. In addition this patio deck at the pre-sell Vancouver Condos at Concord Pacific COSMO will present built in seating, outdoor kitchen, BBQs, fire pit and also a hot tub with views. Next door to COSMO will be the amenities at the Spectrum Towers by Concord, which will be accessible and available to all homebuyers at this development, which is an added bonus. When comparing the two developments, the Spectrum Towers are slightly taller than the Vancouver COSMO condos and the highrise will also step upwards up to the 11th floor with an architectural break in design. The COSMO Vancouver condo tower will also have an exterior façade of red, blue and yellow columns with red railings and multi coloured townhome entrances as well. Here is more information regarding the B.C. HST Rebate or partial HST Rebate on new homes after June 2010. Located in the developing Northeast False Creek Vancouver real estate district, the new pre-sell Vancouver COSMO Concord Pacific condominiums are clearly part of the cutting edge master planned district that is fast becoming a hot spot for homebuyers and investors. As one of the largest undeveloped areas of all of Vancouver, the Northeast False Creek real estate community is transforming very quickly into a high-end yet affordable neighbourhood for lifestyles and homebuyers of all ages. From city hall to Concord Pacific and from Woodwards to the SkyTrain station, there has been a lot of investment that has be put into the Northeast False Creek real estate corridor, and the Vancouver COSMO condos will become part of this master planned community that is one of the few bright lights in the property market in the Lower Mainland through the economic crisis. The Concord Pacific COSMO presentation centre and model suite is that of a 2 bed and 2 bath unit that are eight hundred and sixty square feet in size. There will be only 22 of these highly sought after family sized condominiums at the Northeast False creek Vancouver COSMO tower and will overlook the Beatty and Georgia Street intersection. With a couple of colour palettes to choose from, homebuyers viewing the Concord Pacific COSMO model suite should know that the interior design follows the Boutique Scheme. The four colour schemes available to condo homebuyers include the Boutique grey and ivory them versus the Couture gray and ivory theme. The boutique finishings at the pre-construction Vancouver condos at COSMO living is standard and does not require any upgrade costs. However, the Couture theme at the pre-construction COSMO Vancouver condominiums is an upgrade between ten and sixteen thousand dollars, depending on the finishes that condo homebuyers select for their unit. The Couture theme will include a European appliance package for the kitchen that includes the high end Miele brand, high gloss lacquer cabinetry, quartz counter tops in the bathrooms and kitchen surfaces/backsplashes and hardwood engineered floors. Another upgrade for Vancouver condo buyers at COSMO Concord Pacific is a garage parking stall that is $37,500. A first of it’s kind in a new condo development is the downtown Vancouver COSMO 220-volt electric vehicle outlets which are available at a cost of $3900. The 220-Volt electric vehicle outlet is now a requirement according to Vancouver City Hall and Urban Development Institute. www.cosmovancouver.com. The newest condo phase in Chilliwack real estate’s award winning Garrison Crossing master planned community is now upon us. The Residences at Garrison Village condos at Garrison Crossing Chilliwack is part of the first mixed project with sixty one market condos above the community’s new retail village centre. A dozen floor plans ranging from studios to nine hundred and seventy five square foot two bedroom Garrison Crossing suites all with nine foot ceilings, engineered hardwood floors and much more are available now at the new Residences at Garrison Village Chiliwack. Also available are Corian counter tops and low flush toilets. Occupancy for the newest phase of the Chilliwack Garrison Crossing development at Garrison Village residences are anticipated for August 2009. Prices for these new Garrison Village condominiums is from the $150k range. For more information, you can visit the new show suite that is open one to four daily except Fridays on site. For details online about the pre-sale Chilliwack condos at Garrison Village residences, please visit www.theresidencesliving.com. Fresh, urban and first class residences are now available in Chilliwack real estate market at the Residences at Garrison Village. As part of the first phase release of the Garrison Crossing condominium development, the Residences at Garrison Village condo pre-sales are now launching with fresh floor plans, unique designs and great features. Nestled above the vibrant city centre community building, these new condos for sale will present a lot of various functional floor plans, and lifestyle options for home buyers. In addition, all the pre-construction Chilliwack homes for sale at Garrison Village condos will come equipped with the highest level of craftsmanship, detailing and interior features. Spacious two bedroom suites down to studio units are available at the pre-sale Chilliwack real estate property at Garrison Crossing today, so if you are a home buyer looking for innovative designs and a truly urban country feel, The Residences at Garrison Village can deliver on all fronts. You won’t be disappointed! For more information about the pre-construction Chilliwack master planned community at Garrison Crossing, please click here. Garrison Crossing Chiliwack real estate development is already a success and has garnered many property development awards to date. This visionary redevelopment of a previous military facility includes all the fundamental elements that will make a community successful in terms of residential, retail, commercial and lifestyle opportunities. Destined to become the heart of the pre-construction Chilliwack Garrison Crossing neighbourhood, The Residences at Garrison Village condos for sale is just a short walk away from anything you want to see and do within the community itself. Developing this new neighbourhood with a fresh perspective will give it leading edge design and amenities, and these new Chilliwack condominiums for sale represent the best value in the region. Many Residences at Garrison Village homes for sale will also enjoy outstanding views of the surrounding coastal mountains in addition to having a very pedestrian friendly, eco-friendly environment in which to grow up in, raise your family and to work. With a central plaza within Garrison Crossing Chilliwack real estate development with outdoor seats and recreational areas, residences at the Garrison Village condominiums for sale will have the opportunity to live in an urban master planned community that is both affordable and lifestyle oriented. The Garrison Village building development will include a twenty five thousand square foot Cooper’s Food Store in addition to a wide range of other city amenities and services on site including coffee shops, bistros, a pharmacy, financial institutions, eateries and even a video store. Unique to the Chilliwack real estate market, the Garrison Crossing condo residences for sale represent true value and luxury apartments that are built above the retail space in this city centre building. Each of the six residential/mixed used buildings at the Garrison Village residences of Chiliwack will see a distinct style, architecture and community involvement in the master plan. The pre-construction Chilliwack condominiums at Garrison Crossing will have a variety of layouts including studios, 1 and 2 bedroom suites of which some have dens. Inside the homes, you’ll find expression and innovation and attention to detail throughout the finishing. Thoughtful features of these pre-sale Chilliwack condos for sale will include three different colour palettes for homebuyers to chooe from with accent walls, imported ceramic tiling, black walnut or Burmese teak hardwood flooring and Montana walnut wood grain laminate or shaker style cabinetry available. Home buyers at the pre-sale Chilliwack homes for sale at Garrison Village community will also get Corian counter tops, energy efficient stainless steel appliances and many other luxury urban condo features that are not found anywhere else in this real estate market. The blue suite features at Garrison Crossing condos for sale includes Arizona tan and Blue heron accent wall that is classy and elegant or the Green Suite features Abington putty Georgian green accent wall. The Red Suite at the Residences at Garrison Village condominiums will feature Pearl Harbour and chilli pepper accent wall and is very sleek. There are front loading stackable washer and dryer in every condo unit as well as low flush toilets, contemporary single control, high spout facuet with vegetabl spray in addition to 9 foot ceilings and open air balconies. Other features of the pre-construction Chilliwack condos for sale at Garrison Village apartments include soft but durable carpets in the bedrooms in addition to elegant accent tile in bathroom and kitchen with Cristalio glass mosaic blend of blue, red or green. So Where is Garrison Crossing Real Estate Community? The Residences at Garrison Village Condos for sale are located within the master planned Garrison Crossing Chililwack community that is currently under revitalization and construction. Experience Chilliwack’s year round wonderland of adventure that can include winter skiing, climbing, mountain biking, hang gliding and much more. With lots of lakes surrounding Garrison Crossing Chilliwack real estate community, there are tonnes of water sports that you can enjoy as well. From equestrian to hiking and biking and from trails to walking paths, the Garrison Village condo residents will not be short of activities or outdoor pursuits. With educational and cultural insitutions and centres now within Chilliwack, the town has grown significantly in infrastructure, population and amenities through the past decade. On a more day to day level, many urban lifestyle conveniences are also much in evidence and are within walking distance from the new Garrison Village condos for sale at Garrison Crossing. The master planned Chilliwack real estate development is brought to the market by Spruceland Homes, Canada Lands Company and the National Homes Warranty. For more information about the newest release of pre-sale Residences at Garrison Village, please visit the Garrison Crossing sales centre located at 45530 Market Way in Chilliwack, BC. The showhome hours are weekends from 1-4pm as well as open daily from 1-4pm. They are closed on all public holidays and Fridays. For more information, you can also contact 604.824.9592 or 604.858.7179. For online information about the Chilliwack Garrison Village condos for sale, please visit www.theresidencesliving.com today. Featuring over twelve floor plans in six residential condo mixed-use buildings, the Residences at Garrison Village is located in the master planned community of Garrison Crossing in Chilliwack, BC. A new home project by Canada Lands real estate developers, the Residences at Garrison Crossing condos for sale will feature a residential as well as a retail component to this latest neighbourhood in the Garrison Crossing community. With large scale shopping, services and other amenities, residents and homebuyers at the Garrison Village residences and condos for sale will have the utmost in property convenience to get to everything they need within minutes or even seconds. The sales and marketing has just began and the result of the grand opening launch of the Residences at Garrison Village Chilliwack condos for sale garnered more than twelve hundred visitors to the presentation centre and the five model suites available for viewing right now. A social and friendly setup in terms of buildings, floor plans and livable outdoor areas has created a master planned Chilliwack real estate community that is walkable, pedestrian friendly and ultimately perfect for families as well. Canada Lands, a federal Crown corporation is transforming the former Canadian Forces Base Chilliwack into one of the most exciting new developments in the Fraser Valley property market and with lots of interest already, these pre-construction Chilliwack condos at Garrison Village will likely sell out before completion. The pre-construction Chilliwack residences at Garrison Crossing include sixty one opportunities for purchase that are now selling while there are 176 upon completion within six different buildings within the masterplan. In addition, the floor plan sizes for these pre-sale Chilliwack condos range from 480 sf studio plans to 975 sf two bed and two full bath suites. The price range is very affordable and ranges from $149,900 to $279,900 at the time of printing. The sales centre for the Garrison Crossing condos in Chilliwack real estate market is now open at 45530 Market Way and they are open Sunday through Thursday from 1-4pm. The Chilliwack real estate developer includes Spruceland Homes with Canada Lands Company and the architect includes Focus Architecture, The Residences and Kasian for the retail component of Garrison Village buildings. 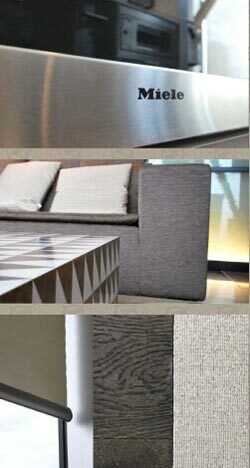 The interior design team is from Kiliban Designs. Also of note is that there are no pre-construction Chilliwack condo waits as the Residences at Garrison Village are now ready for occupancy. The second phase release will be for pre-sale condominiums. 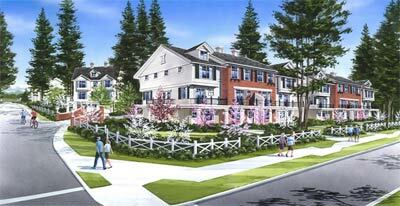 The Pre-Construction Tsawwassen Springs Townhouses and Apartment Suites at Tsawwassen Golf and Country Club Launching! With pre-construction Tsawwassen Springs condo sales coming this fall, one would expect that the proposed development would garner a bit of PR during the lead-up to the official launch. Such is not the case at the redevelopment of the Tsawwassen Golf and Country Club which is now officially named the presale Tsawwassen Springs condo apartments and townhouses. On Thursday, July 30th, 2009, Ron Toigo, a local Greater Vancouver businessman, and partner in the new Tsawwassen real estate development at the Golf and Country Club announced the redevelopment master plan to the Tsawwassen Business Association during a city luncheon. There, Toigo and his business partner, Pat Quinn, formerly associated with the Vancouver Canucks, announced and presented the master plan for the re-development of the Golf and Country Club and the addition of the luxury pre-sale Tsawwassen Springs condominium homes and townhouses for sale. This large scale Tsawwassen real estate development is very new to the growing city, and will encompass the design and construction of 437 (four hundred and thirty seven) pre-construction Tsawwassen Springs townhouses as well as apartment suites in residential buildings that will be selling quite soon. In addition to the residential side of this property redevelopment, the Tsawwassen Golf and Country Club will also see a lengthening of the current golf course (which has already started on site) as well as a new club house. The project approval actually came last year trhough Metro Vancouver and the Delta City Council. The Cost of Home Ownership and Homebuying has increased with the new 12% BC HST. Check out details about the HST Transitional Rules here. As most people know, new condo developments in Tsawwassen do not come very often. They are usually reserved for the downtown Vancouver core, or satellite cities within the city centre. However, the redevelopment of the Tsawwassen Golf and Country Club will have a large scale residential component to it called the pre-construction Tsawwassen Springs condos and family townhouses for sale. The first phase of the presale Tsawwassen Springs property development will see the construction of fifty five market apartments for sale that will range from about eight hundred and seventy five square feet. The first occupancy for these preconstruction Tsawwassen Springs apartment units will be around December 2010 and are expected to be very affordable, starting from around the $320k price range, according to the property developer. Of the twenty five market units available to purchasers, a decision has been made to only pre-sell 25 Tsawwassen Springs condo suites. Currently, as of the beginning of August 2009, 20 of these 25 pre-sale Tsawwassen apartments have already been sold to prospective home buyers. According to Toigo, he wants the homebuyer to see the finished product so that they can experience the lifestyle and features that the apartments for sale have to offer. Some of the new Tsawwassen condos for sale at the Golf and Country Club will have amazing views of the course in addition to views of the mountains. Regency Realty, the sales and marketing agency for the new Tsawwassen Springs apartment condos said that the pre-construction pricing is up to $699k for larger suites up to fifteen hundred and fifty five square feet (family sized homes). Not much information about the pre-sale townhomes at Tsawwassen Springs has been released as of this point, but Toigo and the property developers have indicated that there will be a wide selection of new homes available for downsizers. These floor plans will be spacious and functional and will consist of townhouse style buildings. 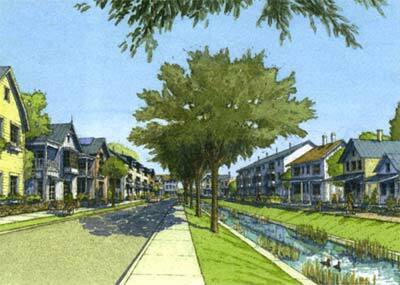 Delta City Council has already approved the development of the presale Tsawwassen Springs townhouses as a component of the master plan, but no townhomes have been released for pre-sales as of yet. Phase 2 of the project will consist of these family townhomes and there will be about forty to fifty of these homes released in the second phase of the project. The average size of the Tsawwassen Springs townhouses will be approximately two thousand square feet of interior space. 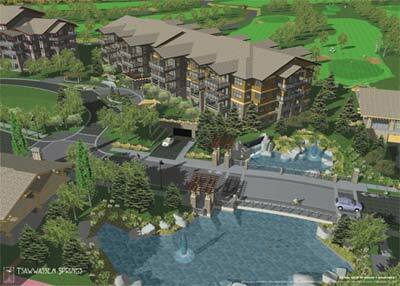 The entire Tsawwassen Golf and Country Club residential project will consist of 194 (one hundred and ninety four) bare land strata townhomes for sale in addition to 243 (two hundred and forty three) Tsawwassen Springs apartment condos. There are no plans for the development of single family detached homes on the property. Interestingly, this Tsawwassen real estate development has a ‘Delta first’ policy that makes any new Tsawwassen Springs townhouse or apartment suite available to Delta residents first before going to the open public market. Not only that, but this entire condo and townhome development was designed with environmental considerations, making it an eco-friendly project with a habitat compensation fund of over three hundred thousand dollars. The redevelopment of the Tsawwassen Golf course will consist of the lengthening of the grounds and the designer, Ted Locke, noted that the completion of the golf course will take place in phases by 2012. The new clubhouse and golf course will remain open to the public. For more information about the pre-construction Tsawwassen Springs apartments and townhouses for sale, please visit the website at www.tsawwassensprings.ca today. More information about the British Columbia HST Rebates and how you can qualify for the maximum rebate of $20,000, please click here. The municipalities and developers have contemplated the redevelopment of the waterfront areas in South Delta and Tsawwassen for years now. From retirement homes, to golf course communities and from new market housing to affordable condo suites, the Tsawwassen and South Delta real estate markets are now changing very quickly. With the Tsawwassen Springs development now underway, Toigo is making a claim as a visionary for the future of both municipalities that will give homebuyers great value and affordability. LOWER MAINLAND REAL ESTATE CONTINUES TO SHOW STRENGTH IN THE SUMMER MONTHS! In fact, the month of July 2009 was a record month for Greater Vancouver real estate sales and showed a continued strengthening of home prices. We have included the full news release from the Real Estate Board of Greater Vancouver for you to view here. What is important to stress is that the Greater Vancouver real estate market continues to see a drop in new housing starts and a return to a healthy equilibrium in the supply side, which is causing prices to increase from Fall 2008 lows. With historically low interest rates in place, it looks as though we can expect a healthy Greater Vancouver real estate market to continue through the summer and into the fall. If you are considering buying a new Greater Vancouver home, now is a great time to take advantage of low prices and low interest rates. Two MAC Bulk condo projects offering incredible opportunity are Keystone Pitt Meadows and Cora Coquitlam. For more information about the new BC HST on homes in Pitt Meadows, Coquitlam and Greater Vancouver real estate markets, click here. 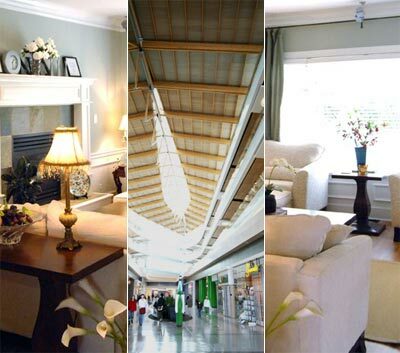 Keystone Condo development is ideally located in the heart of Pitt Meadows real estate market. In their annual report the Real Estate Investment Network (REIN) recently named Pitt Meadows real estate as the #2 Best Place to Invest in BC property. Basing their study on key economic fundamentals, REIN highlighted the Pitt Meadows real estate major transportation infrastructure projects as a key driver to the region's positive future. It also stressed that based on infrastructure improvements and the transition it will bring, that Pitt Meadows real estate will become known as "The Place to Live for Lifestyle". 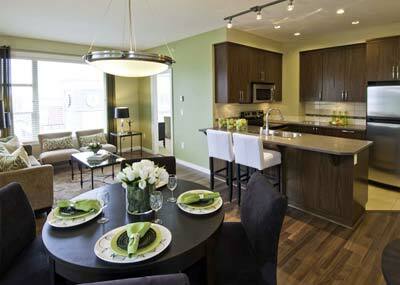 Great homes at the presales Pitt Meadows Keystone Condos are still available at Keystone living. And, all prices INCLUDE GST and 2 Parking stalls at Keystone Pitt Meadows MAC Bulk condo sales! Here are some sample remaining presales Pitt Meadows Keystone condos remaining through MAC Bulk sales: #307 Keystone Pitt Meadows condo development s 946 sf with 2 bedrooms and was priced at $336,943 until presales pricing was slashed to $299,900 for a total savings of $37,064! In addition, Unit #422 at the presales Pitt Meadows Keystone condo development features 946 sf two bed suite originally listed at $379,743 priced down to $314,900 for a great homebuyer savings of $64,843. Lastly, there is Suite #108 at the pre-sales Pitt Meadows condos at Keystone MAC Bulk which is an impressive Pitt Meadows townhome at 1,480 square feet priced at $427,893 and reduced to $329,900 for a savings of $97,993! All of these MAC Bulk Pitt Meadows Keystone Condo opportunities represent great savings for first-time homebuyers in this market. Call 604 633 9988 for more information or to book a private appointment to tour the Keystone Pitt Meadows homes for sale. We are excited to report that only 2 homes remain at Cora Coquitlam MAC Bulk condo sales. Right now you can save an additional $30,000. Suite #1601 East Cora Coquitlam condo tower is 944 square feet with a two bed and den configuration. This presales Coquitlam condo was originally priced at $509,900 and further reduced to $399,900 for an awesome savings of $110,000!. Also available through MAC Bulk Coquitlam Cora Condo sales is Unit #1904 West tower that is a total of 1010 sf (2 bed/den) at a listing price of $523,900 reduced to $418,900 for a great savings of $105,000. Call 604 722 8613 to schedule an appointment with Anky to view these exclusive availabilities at MAC Bulk Cora Coquitlam condo towers today! Warm regards, The MACBulk Team! *Prices subject to change with out notice. E&O.E. Coming soon, the new Crafton Hill Surrey townhouses are now accepting priority registrations for this boutique development. Whistler inspired architecture plus exceptional building quality and finishing detail help set a new standard of style and urban living for Newton Surrey real esate market. This close knit Newton community of 22 Surrey Crafton Hill townhomes for sale are surrounded yb parks, shopping, restaurants, the SkyTrain, and other urban amenities just seconds or minutes away. Soak up some culture at the Surrey Arts Centre or take in a movie at Strawberry Hill Grande Cinemas. In addition, the new pre-construction Surrey Craftin Hill townhomes in Newton real estate market are just minutes to SFU, Kwantlen University and four other premier schools. For more information about the Newton Crafton Hill Surrey townhomes for sale, please visit www.craftonhill.ca or call 604.518.5000 today. Situated close to some of the most tranquil parks and green spaces that have given Surrey the monikor of the City of Parks, Crafton Hill Surrey townhomes for sale is an intimate and boutique collection of just twenty two townhouses. Distinctly family oriented community, this close knit townhouse community features Whistler inspired architecture and high end interior finishing detail, that is expected by today’s home buyer. From solid wood cabinetry to imported porcelain tiling and from painted baseboards and crown mouldings to wainscoting in select units, these new Surrey Crafton Hill townhomes for sale are now available. Close to a vast array of major retail stores that include Winners, Chapters, London Drugs, Real Canadian Superstore and CostCo, the new Crafton Hill Surrey townhomes are also conveniently close to the SkyTrain Station, SFU, Kwantlen University and four other schools. The new townhouses are already under construction on 72nd Avenue just west of King George Highway in Newton Surrey real estae market. The sales centre for Crafton Hill townhouses is re-opening in Late Spring with new pricing and availabilities. Register online today at craftonhill.ca or call 604.518.5000 for more information regarding the sales launch of the Surrey Crafton Hill townhomes. A new townhouse community in the central Newton neighbourhood of Surrey real estate market is now available for purchase at the luxury Crafton Hill townhouses that have been marketed as a great place to both work and play. Naturally positioned and located within urban forest and greenery, there are tranquil areas for you to relax and play throughout the community. As for shopping, the pre-sale Surrey Crafton Hill townhomes will be close to Surrey Central City as well as the Centre of Newton downtown district where you will find a number of great retail stores and boutiques. Also, the Strawberry Hill Grande Cineamas in addition to the Surrey Arts Centre are conveniently located just minutes away from the Newton Crafton Hill Surrey townhomes for sale. For those people who need to get to and from various places in the Lower Mainland, the Crafton Hill homes in Newton Surrey are just a minutes walk from the Newton Exchange bus loop and the SkyTrain. Close to tonnes of schools, SFU and the Kwantlen University, there is no better new community to live in. Brought to you by Star Lane Development, the pre-sale Newton Crafton Hill townhomes for sale are custom designed Surrey homes that have superior quality, great finishes and appealing exteriors. For more details about the new Surrey townhouses, pleaes call 604.518.5000 or you can email craftonhill@realtyline.ca anytime.¬¬¬ A new standard in Newton real estate offerings is now open to the general public and with only twenty two opportunities to purchase, now is the time to purchase your new home with the lowest interest mortgage rates available. Whistler inspired architecture is now available at the Crafton Hill Surrey real estate development that features sophisticated urban living in an ideal setting. Simple, flowing and open concept floorplans great you at the Crafton Hill Newton homes for sale. Quality, function, style and luxury finishes are what you can expect with under mount sinks, shaker cabinetry, security, low-E windows, wood flooring and professional landscaping capping out the great features here at the pre-construction Surrey townhouses at Crafton Hill Newton. Some of the exterior building features of these new Surrey homes for sale include private gardens for each homeowner with individual hose bib, refined professional landscaping with built in sprinkler system, outdoor living balconies for select townhouses in addition to a convenient, safe, secure and family oriented neighbourhood. Some of the interior features at the Crafton Hill Surrey townhomes in Newton community include imported porcelain tile fooring, nylon carpeting, and painted wood baseboards, mouling and trim. The doors are Cambridge style and there are Low-E window glazing in addition to laminate hardwood flooring too. The pre-sale Surrey Crafton Hill homes for sale will have energy efficient fireplace, decora style light switches, electrical baseboards, stacked washer/dryer and pre-wiring for cable and internet. Each Surrey home for sale comes with two secure two car tandem garages, deadbolt lock, security system, and the 2-5-10 year National Home Warrancy. The sumptuous bathrooms at the presale Newtown Crafton Hill townhouses will come complete with porcelain tiled floors, vanity mirror, Kohler plumbing fixtures, handset ceramic tiling, deep soaker tub, chrome accessories and flat paneled laminate cabinetry with stainless steel pulls. They chef style kitchens at the Crafton Hill Surrey Townhomes for sale will include an energy efficicient appliance package, oversized granite counter tops, handset tiled backsplash, traditional solid maple shaker cabinetry, durable stainless steel sink, garburator and contemporary track lighting. There are 3 floorplans available at Crafton Hill Surrey real estate development that includes Plan A at 1352 to 1390 square feet with three bedrooms on the upper level. Plan B is a 1311 to 1379 square foot townhome for sale. Lastly, the largest of the layouts here at the new Surrey Crafton Hill townhomes is Plan C which is 1402 to 1452 square feet. All have three bedrooms and 2.5 baths in addition to lower level tandem garages.